igosmart has no other items for sale. Screen Display: LCD Screen Size: 4.3"
5-stars & i will definitely order from them again!!! I bought this for my 1999 Ram 1500 4x4 ext cab, Install was easy; says the installer... I did not install this cam, and I suggest when it comes to wiring a vehicle, get some one who knows what they are doing.. Anyway, for the price this cam works pretty well for seeing whats behind you. The display is kind of small but, it works for clearing the rear. If you want a bigger display,, pay more money. If you have an old pickup like me and don't want to spend a lot on a back up cam, get this. compact camera, easy installation, barely seen. monitor has nice screen and wiring was easy to follow install. 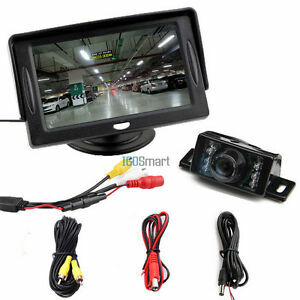 Good value for the price,Great LCD monitor,found to be Easy to wire, is Very helpful to see what is behind you BEFORE you backup ! !..Wonderful item to have,Thank You !!! It helps you see when backing up; nice to have.